The average smartphone user checks his or her phone around 80 times per day, according to research. That equals once every 12 minutes! Surprising? Not really—because some people check their phones far more often than that. These handheld devices have become extensions of ourselves, so much so that one day they will probably literally be extensions of ourselves (cue augmented reality and neural lacing). But let’s not get ahead of ourselves. For now, smartphones are still very much present, allowing us to carry out a wide variety of daily functions—from saying, “Good morning” to mom to ordering groceries right to our front doors. 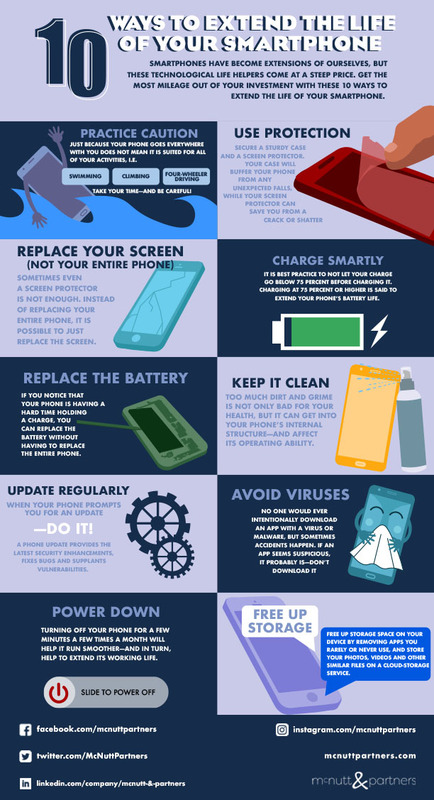 But these technological life helpers come at a steep price, to the point where considering ways to extend the life of your smartphone is in your best interest. People are now keeping their smartphones longer than they ever have (three years compared to two-and-a-half years two years ago, according to Hyla Mobile). Not only are phones more expensive than they once were, but the concept of a free phone upgrade is now obsolete. 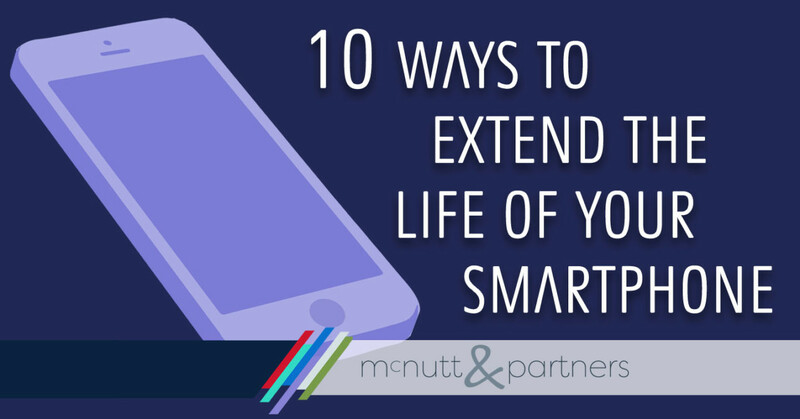 If you’re looking to get the most mileage out of your investment, implement these ways to extend the life of your smartphone. Practice caution. Just because your phone goes everywhere with you does not mean it is suited for all of your activities, (i.e., swimming, climbing, four-wheeler driving). Before you get too excited and jump in the lake with your phone, take a breath and set it down on your towel first. Also, use caution when having your phone on you while working out. Sweat can easily damage phones. Use protection. Secure a sturdy case and a screen protector. Your case will buffer your phone from any unexpected falls, while your screen protector can save you the hundreds of dollars it costs to replace a screen in the event of a crack or shatter. Try a tempered glass screen protector, or even a stick-on one is better than nothing. Replace your screen (not your entire phone). Sometimes even a screen protector is not enough to protect your smartphone from the hardest of falls. Instead of replacing your entire phone, just replace the screen. On higher-end models, this can run you more than $300 at times, and if it’s a $1,000 phone, then you’re still saving money. Charge smartly. You may have heard that keeping your phone on the charger past 100 percent will kill your battery—experts say this is NOT true. However, it is best practice to not let your charge go below 75 percent before charging it. Charging at 75 percent or higher is said to extend your phone’s battery life. Replace the battery. Smart phone batteries generally start to decline after about two years. If you notice that your smart phone is having a hard time holding a charge, you can replace the battery (typically for about $100 or less) without having to replace the entire phone. Keep it clean. It’s no secret—our smartphones are covered in bacteria. In fact, the average smart phone is 10 times dirtier than a toilet seat, according to the University of Arizona. Too much dirt and grime is not only bad for your health, but it can get into your phone’s internal structure—and affect its operating ability. Update regularly. When your phone prompts you for an update—do it! A phone update provides the latest security enhancements, fixes bugs and resolves vulnerabilities. While updates are a way to extend the life of your smartphone, there will eventually come a point where your phone is too old for the next update, and then it’s time for a new one. Avoid viruses. No one would ever intentionally download an app with a virus or malware, but sometimes accidents happen. If an app seems suspicious, it probably is—don’t download it. If you downloaded an app, and now your phone is acting up, check the app’s data usage to determine whether it is sending out information to a third party. Free up storage. Speaking of apps, another way to extend the life of your smartphone is to free up storage space on your device by removing apps you rarely or never use. You can also significantly free up space by storing your photos, videos and other similar files on a cloud-storage service. Google, Apple and Amazon all offer cloud storage services. Power down. Sometimes we all need a break—and your phone is no different! Turning off your phone for a few minutes a few times a month will help it run smoother—and in turn, help to extend its working life. Your smartphone is your lifeline for communication, knowledge, entertainment and so much more—so treat it with care. Doing so only serves to help you save money and avoid headaches in the long run. Another great use for smartphones? Marketing to a mobile consumer base! Need help? Call us at 334-521-1010, or visit our contact page.